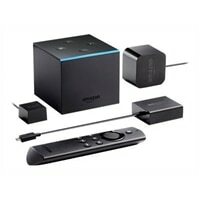 Amazon Fire TV Cube - Digital multimedia receiver - 4K - HDR - 16 GB - with Alexa Voice RemoteFire TV Cube is the first hands-free streaming media player with Alexa, delivering an all-in-one entertainment experience. Watch as thousands of movies and TV episodes come to life with vibrant colors and detailed contrast in 4K Ultra HD and HDR. Fire TV Cube is the first hands-free streaming media player with Alexa, delivering an all-in-one entertainment experience. Watch as thousands of movies and TV episodes come to life with vibrant colors and detailed contrast in 4K Ultra HD and HDR.